ROCKVILLE, Md., Jan. 18, 2019 /PRNewswire/ -- Federal Realty Investment Trust (NYSE: FRT) today announced PUMA North America signed a long-term lease for 150,000 square feet of office space to anchor a new 300,000 square foot office building at 455 Grand Union Boulevard at Assembly Row, the rapidly growing, mixed-use neighborhood just minutes from downtown Boston. The new office building will also include ground floor retail space. "We have spent the past ten years working with the City of Somerville to create a dynamic neighborhood that attracts world class companies," said Patrick McMahon, vice president development at Federal Realty Investment Trust. "We are excited that PUMA has placed long-term value on the Assembly Row location, our expansive array of high-quality amenities, vibrant mix of uses and direct access to the T and highway. We look forward to welcoming the PUMA team with our more than 10 soccer field's worth of amenities and watching PUMA sustain its position as an international leader in the sports brand world." 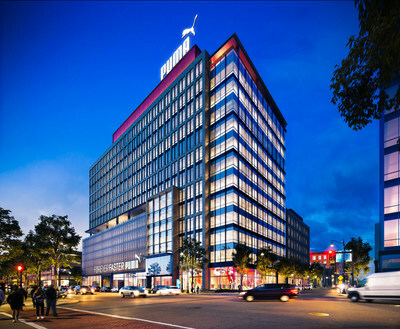 With the signing of the PUMA lease, Federal Realty also announced the launch of Phase 3 of Assembly Row which includes in addition to 455 Grand Union Boulevard a 500-unit residential building, with ground floor retail space. The estimated total investment in Phase 3 is expected to be approximately $475 million. Upon completion of Phase 3, total investment at Assembly Row will be approximately $1.2 billion. 455 Grand Union Boulevard will be a 13-story, 300,000 SF Class A office building with 550 dedicated parking spaces and approximately 25,000 SF of ground floor retail. The office space is now under construction and 50% pre-leased to PUMA who expects to relocate 450 employees from offices in Boston and their current headquarters building in Westford, Massachusetts beginning in 2021. The neighborhood's existing office space at 450 Artisan Way is currently 100 percent leased. Assembly Row is also home to the 730,000 square foot Partners Healthcare corporate headquarters. The on-site Assembly T Station and direct access to I-93 provide unrivaled access to Greater Boston. Phase 3 of Assembly Row also includes a new, 24-story, 500-unit apartment building, with 30,000 square feet of ground floor retail space, across from the T station. The new residential building will begin pre-leasing in early-2021 and features a robust amenity package including a 24th floor roof deck and innovative co-working style pods for entrepreneurs. Located directly across from the entrance to the MBTA Orange Line station, residents will enjoy a seven-minute connection to Downtown Boston. Currently, Assembly Row is home to more than 1,300 residents who enjoy access to the neighborhood's diverse shopping, amenities, entertainment, services and conveniences. "We are thrilled with the market acceptance and maturation of Assembly Row, and the continued expansion of our vibrant mixed-use portfolio," said Don Wood, president and CEO of Federal Realty Investment Trust. "Advancing Phase 3 at Assembly Row reflects our continued progress in developing progressive mixed-use projects, and harvesting value from great real estate highlighted by authentic street level experiences, best-in-class merchandising and a vibrant mix of uses." Upon completion of Phase 3, Assembly Row will include more than 55 shops, 22 restaurants, 1,514 residential units, 1.1M SF of Class A office space and The Row Hotel at Assembly Row, a 158-room Marriott Autograph Collection Hotel. Additional entitlements remain for approximately 1.5 million square feet of commercial space and 329 residential units. Assembly Row is one of Greater Boston's hottest new neighborhood destination. Conveniently located along I-93 and with direct access to Downtown Boston via the Orange Line and its dedicated MBTA station, Assembly Row is a dynamic neighborhood that offers first-class working, living, shopping, entertainment, and dining experiences. With Phase I and II now complete, Assembly boasts 830,000 square feet of office space, 1,000 residential units, a 158-key hotel, and 500,000 square feet of retail, restaurant, and entertainment. When fully built across 40 acres along the Mystic River, the Assembly Row neighborhood will feature a total of 635,000 square feet of retail and restaurant space, 2.0 million square feet of office space, and 1,800 residences. Assembly currently offers more than 30 nationally branded outlets, including names like Polo Ralph Lauren, Nike Factory, Saks Fifth Avenue OFF 5TH, and J. Crew Factory. Entertainment options include the 12-screen AMC Assembly Row 12 and IMAX, the only LEGOLAND Discovery Center in New England and Lucky Strike Social. More than a dozen eateries line the Riverfront Park and streets, including Legal On The Mystic, Earl's Kitchen + Bar, Tony C's, Caffe Nero, American Fresh Brewhouse, River Bar and The Smoke Shop. 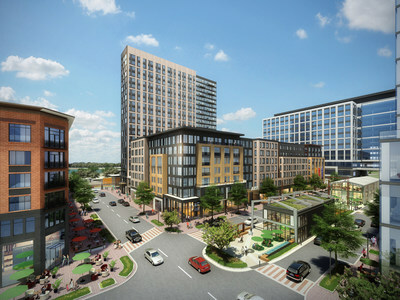 For more information please visit www.AssemblyRow.com. Certain matters discussed within this press release may be deemed to be forward-looking statements within the meaning of the federal securities laws and although Federal Realty believes the expectations reflected in the forward-looking statements are based on reasonable assumptions, it can give no assurance that its expectations will be attained. These factors include, but are not limited to, the risk factors described in our Annual Report on Form 10-K filed on February 13, 2018.